I can't believe it's already been three weeks since I came home from Fall Dapper Day at Walt Disney World. Believe it or not, this trip certainly surpassed the super high expectations I had for it. Saturday, November 18th, was Fall Dapper Day at Magic Kingdom as well as Mickey and Minnie's 89th Birthday! Those two events combined with it being the Saturday before Thanksgiving made for an incredibly crowded Magic Kingdom. The weather couldn't have possibly been more perfect with highs in the upper 70's and low 80's. Tracy and I decided a few months back, that we were going to do a Frontierland theme for Magic Kingdom day, and we are both excited with how our outfits turned out. Frontierland is a gorgeous backdrop for photos, and a Southwest look is something totally outside of my wheelhouse. 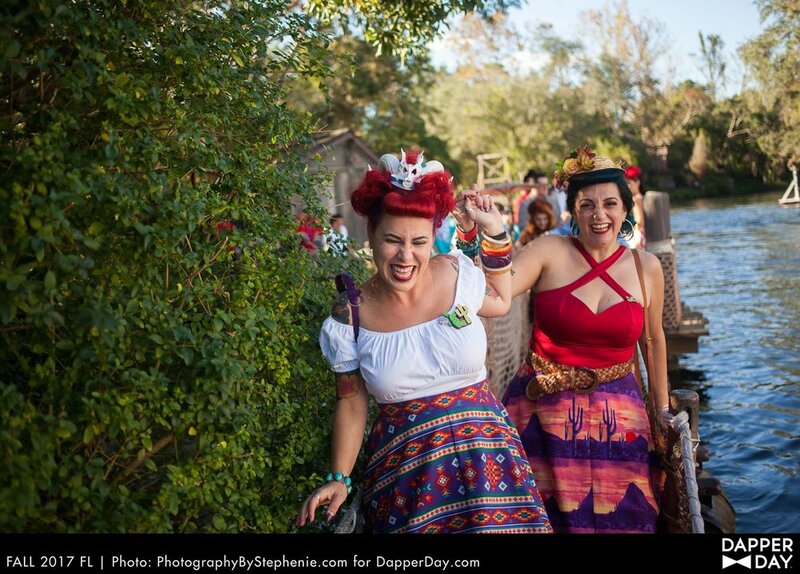 To me, Dapper Day is all about pushing my boundaries, my creativity, and my comfort zone. I spend countless hours searching on Pinterest, Etsy, and Instagram for unique and outrageous ways to portray my outfit themes. I want it to be obvious what I'm going for, but at the same time I don't want it to be so simple that it's something lots of other people are going for. There's a perfect middle ground where I like to live. As corny as it sounds, you want to have a great photo location in mind when you're putting together your Dapper Day outfit. Since we had decided on a Frontierland theme for this particular day, we really had tons of options for photos as Frontierland is an entire area as opposed to a character, or individual ride. I truly believe if it weren't for events like Dapper Day, I would always do exactly the same rides, parades, shows at the parks, and I would constantly miss and walk by some of the incredible details Disney puts in to every little nook and cranny at the parks. For example, the photo above, I've walked by that spot a zillion times in my life, but I never REALLY noticed it before. Sure enough, it's an ideal location for any Southwest, Desert, Frontierland, Western themed outfits you may have. Theming your outfits really forces you to seek out those one of a kind spots, and find the details when you typically just pass them up. This allows me to enjoy and appreciate the parks in an entirely new light, and I highly suggest you give it a try sometime. Park days aren't always about rushing from one attraction to the next, some of the absolute most stunning Disney magic is found when you just take a moment and really absorb all the little nuances and details of your surroundings. At the end of the day... it's really all about the details. The small accents and details in your outfit, and the opportunity to find the details in a park you may already know like the back of your hand. It makes for an incredible and unique visit that you'll never forget. Do you have some favorite hidden spots in the parks where you like to snap some incredible images? Let me know in the comments!